- Premium speakers with Dolby processing let you stream music and books in crisp, stereo sound. With a vibrant 10.1" HD screen for watching videos, movies, and TV shows—in a new fabric design. - Stream music and podcasts from Amazon Music, Spotify, Radioplayer, and Deezer with powerful stereo sound. - Watch movies and shows from Prime Video, or the news. 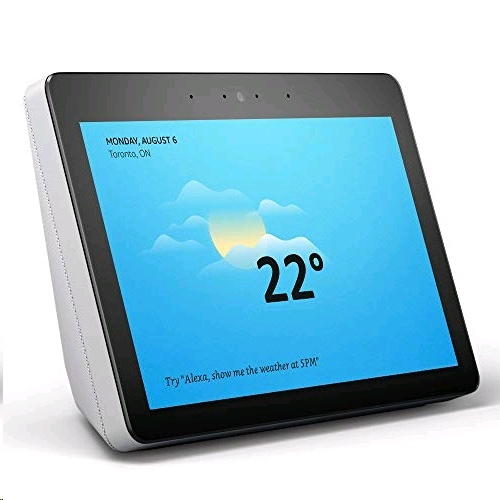 - Make video calls to anyone with the Alexa app, an Echo Spot, or Echo Show. (Skype coming soon!) - Your new kitchen companion—set timers and alarms, and add items to your shopping list. - Set up compatible Zigbee devices without the need for a separate hub. See your front door camera stream. - With eight microphones and far-field technology, Alexa can hear you even while music is playing.